In Exploratory Writing, I recently finished writing my theme poem (stress causes pain). Using our poem, we created a poster with a picture made up of words related to the theme. We also added the poem itself into the poster. After finishing the poster, we used the app called, explain everything, to create a video explaining the reason behind the way the poem was organized. Posted in Uncategorized, Writing 8 on April 29, 2016 by Kamille. Honestly, I don't have a lot of professional qualities. However, as a student, I do contain a couple professional qualities. I am a student that tries my best to learn and do well in school. I am quite a perfectionist especially when it comes to my grades. When I am assigned a quiz or a test I make sure to study beforehand. I am a student that loves to learn and reaches out to teachers when I have a hard time understanding the topic. I also make sure to ask questions in class to clarify my confusion. Outside of school, I also play sports such as basketball, volleyball, and soccer. I want to make sure to balance my life so that I don't spend all of my time on school. These sports have allowed me to build great leadership and also perseverance. I don't give up easily and I work extremely hard in school and in sports. Although I do have a couple professional qualities, I also have some non-professional qualities. I am not really an organized person when it comes to anything really. Although I make time to study, it doesn't mean it's easy. I can't keep track of my schedules and sometimes I forget things (But not assignments, homework, tests, quizzes). My folders are messy and so is my locker. Another non-professional quality is the fact I don't manage my time to well. Sports do get in the way of school, however, they are a way to relax me. Unfortunately, it doesn't make my homework disappear and it's hard to manage my commitment to sports and studying. In other words, I am not the best at organization and time management. Posted in Language Arts 8 on April 25, 2016 by Kamille. In writing, we were required to write a poem containing line breaks and white space. We created a video explaining why we used line breaks and whites spaces in different parts of our poem. Posted in Grade 8, Writing 8 on April 7, 2016 by Kamille. 1, 2 , 3. Hands Up! In PE we had a nutrition project where we had to create a meal following the Harvard Healthy Eating Plate. Bunny, Carl, and I were put into a group. We decided to create an asian style cooked salmon, a spinach/broccoli cream soup, brown rise, and a parfait. Here is the link to our book. Posted in Grade 8, P.E. 8, Uncategorized on April 6, 2016 by Kamille. In P.E, we have recently finished our soccer unit and I thought it was extremely fun. We were put into equal and fair teams and in these teams, we were given individual roles. My team consisted of Quoc Anh, Bunny, Josiah, and Seok Jin. The roles played in the team were publicist, captain, fitness trainer, equipment manager, statistician, and fair play coordinator. I was selected as the captain of the team and I also played the role of the fair play coordinator. Your role as a captain is to basically “coach” your team. So in order to do so you run practices and drills. You also decide the positions and plays your teammates will do. Since there was an extra role to play, I was also fair play coordinator. This job required me to “grade” my teammates in terms of sportsmanship. At the end of the class I would have to write a positive and negative note about each player including myself. It may seam biased, however, I merged the team talk and the fair play grades together. So as a captain, I would discuss the things I thought we did well and needed to improve on, but I also allowed my teammates to talk. Through this discussion, I would be able to write the notes as fair play and also grade all of us based on our opinions. Overall, thought these roles couldn’t have worked together any better. I didn’t have a lot of challenges as the fair play coordinator because our team would decide an overall grade for the each of us during the team talk. However, as captain I thought it was a little more challenging. The main struggle I faced was explaining the drills because some of them required a lot of movement. And I have to say that my team was great at understanding the drills even when they were badly explained. Which is one of the reasons why I was able to get passed that struggle because my teammates were great listeners and adapted to my explanations. My running times were all in the range of 6:03 to 5:50 minutes. I would either improve by a few seconds or slow down my few seconds. So, I think I have reached the time where I can’t improve a great amount because I am already in my fastest time “zone”. I don’t really have much to say about our fair play points. I think we were a great team because we worked well together, we tried our best all the time, and we were always on task. Our team all got 30 out of 30 and the reason why I thought we deserved this grade is because we worked so well together. I felt team encouraged positivity and hard work. I really think this kind of unit should continue, it was unique and also fun. I’m not so sure if there is a way to improve it because I feel like there are some teams that have succeeded and other that haven’t. And in my case, our team definitely succeeded. I think that Ms. C should continue making the teams and if possible, make the unit a little longer. I would definitely recommend this unit to other because it is fun and a great experience. Posted in P.E. 8, Uncategorized on March 14, 2016 by Kamille. This project will be a skit. There are two characters in this project the job recruiter and the person applying for the job. If you need a script only the mandarin characters can be included. Like I mentioned, I did my project with Tina and Jenna. I was the recruiter and they were being interviewed. The project was pretty straight forward, so as the recruiter it was extremely easy to write out the script. Posted in Mandarin 8, Uncategorized on February 16, 2016 by Kamille. In science, we started off the year with our chemistry unit and Mr. Swart used the lecture style to teach us. He would basically use the whole class to talk about a subtopic. While he would give a lecture about it, we would fill in a document he created for us. These documents end up being helpful when we study for quizzes, tests, and assignments. He also made presentations to go along with his lecture, which contained images. Personally, I felt like this was a really easy way to learn. I am a very visual and kinetic learner, so this was a really good way to understand the topics. So that was definetely an advantage in this unit. To be honest, I thought that there weren't any disadvantages by using the lecture style. I was able to understand the topics very well and it reflected on my grades. In this unit we took a couple quizzes, we conducted labs, we had a final project, and we had a final test. The project had to do with creating a video to explain a topic on the test. The test would include 5 main topics which all students would each make a common craft video. After everyone finished the project, Mr. Swart made a super playlist and our video made it on the playlist. Currently, out of all the units I have been the most successful with the chemistry unit. The second unit was on ecology and Mr. Swart decided to use the independent learning technique. Personally, I felt it was really difficult to self teach a topic that I have never learned before. I struggled a lot because it wasn't as easy to understand the topic through a computer instead of a teacher. However, since I was a visual learner I was able to watch the videos which suited the way I learned. The videos helped me understand the topic a lot easier than the articles. Mr. Swart made a document with pretty much everything we needed. There were links to all the videos, the articles, and interactive activities we could use to learn about the topic. Using that information he created documents with questions that we needed to answer. Although we were provided everything to learn, I did struggle. At first, I thought I was doing okay and that I was understanding the topic, but when I got my first grade I realized I was doing something wrong. In this unit we were assigned a 2 part project and a test. The first part of the project finding a video on a solution humans have created and we needed to find an article on a problem humans have caused. Then we would add that on a google map Mr. Swart created. The second part of the project was to create a video recommending solutions on one of the problems someone else has added on the map. Overall, I felt like it wasn't the best way to learn. Posted in Science 8 on February 3, 2016 by Kamille. This semester in Art we are heading into a sculpture unit, specifically chair sculptures. This project is really open to anything and we can choose our very own theme for the chair. However, on e condition to creating our chair sculpture is to be able to see the chair in every angle. This unit aims towards creating 3D sculptures on the chair instead of keeping it “flat” in other words decorated. In order to pick our top 3 themes, we had to go through a process. The first step was to brainstorm as many themes possible and they could completely be random. After doing a couple group activities we were required to select our top 3 themes. My top 3 themes are candles, under the sea, and inside my mind. The reason why I chose candles, under the sea, and inside my mind as my top three themes is because they are unlimited. What I mean by that is these themes allow me to think outside the box. I can play with the textures, colours, shapes, and sizes. I believe these themes could be really unique and interesting once applied to the chairs. So far I would say my favourite theme would be "inside my mind" because I feel like there is the most amount of imaginary parts I could apply to my sculpture. I feel I can go over and beyond with that theme and play with a bunch of colours, textures, patterns, and objects. I also think I could demonstrate the mind of a person in multiple different ways which could also be interesting. I believe the most challenging part of this unit to me would be actually figuring out how to create my design using multiple sculpting techniques. And based on my favourite design it would be especially hard to create the sculpture, due to its complexity. 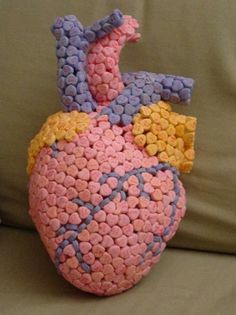 This is an example of an additive sculpture because this artist added multiple candy hearts to create a sculpture of a human heart. This is an example of a subtractive sculpture because this sculpture use to be a piece of wood but then the wood was carved into this sculpture. This is an example of a kinetic sculpture because it moves due to the wind. This sculpture was purposely created to move because it was put outside to receive the wind. In art, we watched a video about the basic elements of sculptures and we were assigned to select pictures and add notes explaining which element this sculpture included. So far I am really proud of finding an easier and simple technique to create these strands of hair because I have been able to make a couple really efficiently. I've really improved making the frames of the flat strands of hair because I really struggled at the beginning. The wires were really thick and didn't bend easily, so when I hot glued two wires they would unstick. When this happened I decided to create the frame by wrapping the wires with masking tape. However, it took a really long time. Now, I decided to create the frames using a thinner wire which didn't unstick when it was hot glued. I've surprised myself by how easy it was to create the thick strands of hair. I decided to start creating the thick strand of hair by using a wire to make the shape and scrunching foil around it. Afterwards, I would wrap it in newspaper which made it thicker. This process was super easy and fast. Then I would just plaster the thick strand of hair to the chair. To this day, I still use this method to create the thick strands of hair. What was your theme, explain your chair what is the audience looking at? Originally the theme of the chair was supposed to be “inside my mind and creativity”. However, as I was constructing the chair the theme transitioned towards “identity, imagination/creativity, and dreams”. The blank face on the chair, is supposed to represent a person with no identity. The person’s creativity and imagination are portrayed throughout the movement of the strands of hair. The dream catcher in the center of the sculpture was supposed to express the importance of the person's dreams. How did you apply the 4 strongest elements? The 4 strongest elements are space, textures, lines, and colours. I used my space well because I wanted to show the movement of the sculpture and guide the audience's eyes. Since I used raw materials, there were a lot of textures such as rough, smooth, bumpy, etc. I also used lines, to highlight the sharp edges. The sharp edges also played a key role in guiding the audience's eyes throughout the chair. Like I mentioned, I used raw materials which followed a nice color scheme which was easy and pleasing to the eyes. What did you learn from the design cycle ( look at the sheet on Moodle or screenshot on your blog)? I learned that the design cycle was one of the most crucial parts in creating the sculpture. The more organised and planned the sculpture was, the easier it was to create it. It is really important to follow the steps of the design cycle because if not, it might not turn out the way it was planned. When it comes to researching, it is essential to find the majority of the techniques to create the sculpture; it would save a lot of time and make it easier to construct it. Honestly, I would have followed the design cycle more precisely and have a more organized plan. I think the reason why I wasted so much time was because I did not know what techniques to use and how to create my sculptures. I would have also wanted to create a more detailed sketch of my sculpture because I had to figure out what to do along the way, instead of following a specific drawing. What did you think of this unit and how did you develop as an artist? I thought this unit was extremely fun because I was able to use my creativity and expand on my sculpture abilities. By creating this sculpture, I now have the ability to create wireframes, use plaster, and make take sculptures. As an artist, I have learned that organization is pivotal and essential in creating sculptures. The more specific and polished the plan is, the easier it is to construct the sculpture. Overall, I thought this project was a great opportunity to learn for my future sculptures. Posted in Art 8 on January 15, 2016 by Kamille. We recently started the second semester and looking back at last semester's advisory (Mr. Swart), I realized we have accomplished multiple goals including advisory goals. The primary advisory goals are getting to know our advisor, making new friends, relaxing, and having fun. Last semester we had a paper tower contest, meetings with our first grade buddies, house league meetings, house league games, tutorial, and simple "catching up" conversations. Clearly, we have already accomplished one of our advisory goals, which are relaxing and having fun. While having conversations and spending time in advisory, I was able to get to know more of my classmates. As a result I was able to make new friends and strengthen other friendships. Finally, it leaves me with the last goal, which is getting to know my advisor. From the advisory conversations we were all able to learn a lot about our advisor, Mr. Swart. So overall, I believe last semester was successful based on accomplishing our advisory goals. Posted in Advisory 8 on January 14, 2016 by Kamille. I recently started my second semester at SSIS and looking back at last semester I would like t make a couple changes, starting with setting a few goals for the new year. Firstly, I would like to start off with my academic goals. After reflecting on last semester I realised I haven’t been reading as much as I wanted, so I decided to set a goal on reading at least 8 books this semester; since I only read about 4 books last semester. Reading is really important to me because I struggle reading fast and I’m hoping to improve my reading speed. Another academic goal this year would be to improve the way I write, considering I struggle at that too. So in order to do so, I have decided to start a journal which I will use to write anything I want including my stream of consciousness at least once a week. Hopefully this will help the way I write by improving my sentence structures. Secondly, I would also like tho set social goals to keep my life balanced out with sports and school. The very first social goal I could think of was to organize more time to spend with my family, specifically with my sibling. I have set this goal because last semester I was so caught up with homework, that I literally lived in my room after school. And my siblings always want to play outside and do activities with me, but I always turn them down. Another social goal of mine is to spend more time with my friends face to face and less online. Teenagers these days lack spending time with friends outside of school without using social networks. So I’m hoping to spend time with my friends (face to face) at once every three weeks. I know it may not seem a lot but middle school makes it hard to stay social even on weekends. Thirdly, it’s always important to have personal, so I decided to create a couple for myself. These goals which I have created for myself are all related to relieve stress and increase my mental well being. The first goal focuses on the way I look at things. I would like to develop a stronger positive outlook, to help outweigh my stress. Especial at times when I feel like I will never get all the homework, projects, assignments, and studying in time. Another goal is to make time for myself, not that I don’t have time for myself, but a time when I just shut off all the stress in my life and school to just watch a movie, go shopping, or to just read. So I’m hoping these academic, social, and personal goals will be achieved by at least the end of this semester. Posted in Language Arts 8 on January 13, 2016 by Kamille.